Judge in Broward County; Dr.
chairmen of the evening are Dr.
Dr. Paul and Ruth Rodensky. at the Hallandale Jewish Center. Jew." College students will "rap"
ish population on the campus?" ticipate in our optional tours. flight from Eilat to Lod Airport. 2500 East Hallandale Beach Blvd. paign Big Gifts Cocktail Party. many in the South Broward area. lowing World War II, Rev. ing cost of meeting them." noted, cash receipts in N.
Board for many years. Mrs.
dollars in 1982," Mrs. Brizel said. er, Ruth Glickman, Jo Ann Katz and Esther Gordon. people in the metropolitan area,"
ish Federation of South Broward. pi left are Marilyn Neuman, Rhea Krieger, Beverly Shapiro and Ha Hersch. ', Bertha Goldberg, Suaen Grossman and Carol Press. > from left are Susan Singer, Hannah Adel and Merry Liff. Ung from left are Brenda Greenman and Joyce Newman. traditions of our faith will be upheld. " | Fort Lauderdale, FL 33313. Attn: Pre-Need Director. 1 COST OR OBLIGATION TO ME. Serving chapels throughout the U.S. and Canada. In Broward, 742-6000. In Dade, 945-3939. And coming soon to North Miami Beacn. Menorah Chapels Cemetery Counseling Service is available at no charge. Philip A Lavtn uo ui IMaay. Sacratary Jo Aiw Ratt. Traaiunv Tnaooora Iwm"
bargain. History tells the story. would anger our "moderate Arab friends." where and in the Persian Gulf primarily. debate on the Senate floor Nov.
17. The remark was made by Sen.
tors interrupted to challenge him. by reason of being >? Towers of Oceanview Park; and Dr. Abraham R. Dokson. Klan efforts in West Germany. group also committed to violence. Torah and Temple Beth Sholom. td from left are David Lurie, Park Layne Towers, Emanuel L.
ray ( iid r in. Fairways Roy ale; and Julius Brenner, Olympus. Tan reasons why you should stay at our Brooklyn hotal. kimelblol. area coordinator; and Frances Briefer, area coordinator. Seated from left are France. Ehrlich, Anne Lowe and Millie Wilder. food a truly festive event. Seated from left are Ann Orenstein, ftr-ll, Wolf . 100 E. Hallandak Baach Blvd. Men** HalUndali Chamfer ol Commnce Batty Buuntti Owso"
chairwoman; and Nancy Brizel, Campaign vice president. ordinator; and Molly Silver, area coordinator. J from left are Aniela Frumkin, Rose Appel and Sally Ambrose. nan. arrangements chairwoman; and Estelle Glattman. ril from left are Rose Pollen, Ethel Gould and Ada Engelman. fo mm unity Relations Committee! Richter led the Chanukah songs. For special payment arrangements, please check..
parents from Baltimore. Also Dr.
and Betty Homana, Jo Noble. joyful chanting of the Birkat. ber- attended the Bar Mitzvah. Jamie Mark Topolski. son oi i/r. coff. Dr. George and Iris Crane. crest are very proud parents. leaders in Pinellas County (St.
tacular are in such demand. has to weigh a ton? you tan create a perfect holidas kugel. dnnamonsprinkle on lop of noodle* Bake i )') .bou. IS. rr products have lhre.| of .pprov.l of the Union of Orthodox Jgwish Conreg.t.on "* A"-"**"
I, Harry Cohen, Morrie Rosenthal and Frank Levinson. i Leon Oser, Harry Slavitt and Morse Engelman. i Roth, Sally Ambrose, Blanche and Jack Rose. live in. And Scotland is no exception. the world. And one of the city's largest kilt-makers is Jewish. JckB to make them feel at home. and endorsed. Ask for them. Plus. aHow 6 weeki to receive your check. steam, according to Jerome J.
and in their own communities. In Hallandale 3149 Hallandale Beach Blvd.. Hallandale. Irving Cypen, Chairman of the Board Harold Beck, President. Aaron Kravitz, Chm. Thrift Shop Committee. Fred D. Hirt. Executive Director. for only 25< a serving. shoppers look for economy and valuebargains like Wolff's Kasha. proteins in the plant kingdom. serving-a true bargain in these inflationary times. Wolffs Kasha boxtop or a card with the words Wolffs Kasha"
Iiiirman; Tom Dine, guest speaker; Betty and Bob Gaynor. rhbuum and Dr. David Sachs at the General Assembly in St.
TO BRING SPARKLE TO YOUR HOLIDAY. a new zest on lHL0 your holiday table. Mott's uses only V the finest fruit. tions at the area's institutions. Dec. 4. Mai Golden. Ph. D..
on campus will be discussed. Thursday, Dec. 17 at 5:30 p.m. There will be a gift exchange. In your favor at Balogh Jewelers. PROFESSIONALS DEALING WITH PEOPLE SINCE 1910. And Kosher f^re ^ **" V l they're guaranteed. hers; and $22.50 for guests. er in the field of music. i Tuesday, from 1 p.m.
single men and single women. High Holy Day tickets included. Membership year begins Jan. 1.
organizations in the near future. Makes the Most of Chef Boy-ar-dee Cheese Ravioli. tently cup after cup after cup. A living tradition in Jewish homes for over half a century. gram at the highest levels. tribute dinner are Rabbi and Mrs.
Robert Frazin and Mr. and Mrs.
are Mr. and Mrs. Alan Fbke. Mr.
Mrs. Robert Wo If son. Bonds committee. Mrs. Frost is. 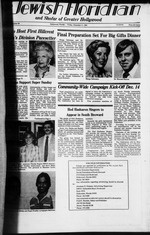 day evening, Dec. 2, at 8 p.m.
be honored by B'nai B'rith in 1981. T would just be a bore"
Your synagogue Is the spiritual center of your community. staff, you should consider Tru-Check Computer Systems. reports that summarize at a glance the fiscal status of your operation. System. And gat back to the real business of your synagogue. Gertrude Falk, Hannah Adel, Toby Greenberg and Birdie Fell. Mock, Daisy Rubin and Bea MogilowiU. Please send ma literature on the above. NORTON...FOR A LITTLE MORE PEACE OF MIND! CORAL GABLES HIALCAH/PALM SPRINGS MIL!